Nikon D4 with More shooting modes: With Canon 1D X you can use Canon EF lenses only, but with Nikon D4 you can use DX and FX lenses, Nikon D4 offers four image area options: FX format (36.0 x 23.9 mm), 5:4 crop (29.9 x 23.9 mm), 1.2x crop (29.9 x 19.9 mm) and DX format (23.4 x 15.5 mm). The camera also offers three image area options for Full HD video thereby tripling its potential for moviemaking. About the Sensor: Nikon D4 features 16.2 megapixels Full frame (36 x 23.9 mm) CMOS Sensor and Canon 1D X 18.1 megapixels Full frame (36 x 24 mm) CMOS Sensor , the EOS-1DX’s photodiodes are 21% larger than those in the 1Ds Mark III. According to the specification, for low light situation Canon 1D X is better, you get two extra stops of Standard ISO range. Canon 1D X is disappointing to many extender users. AF is unavailable on the EOS-1D X when lenses with a maximum aperture of f/8 are used. In Nikon D4 11 focus points are fully functional when lenses with a maximum aperture of f/8 are used. Five central focus points and three points to the left and right of them in the middle line are compatible with f/8. This enables very precise focus acquisition with sports photography and the like when super-telephoto NIKKOR lenses are used with a teleconverter (2.0x) at a combined aperture value of f/8. F8 Lens: adding a 1.4x extender to an f/5.6 max aperture lens results in an f/8 max aperture lens or adding a 2x extender to an f/4 max aperture lens results in an f/8 max aperture lens. Nikon D4 features same (old) AF engine used in D3 DSLR – Multi-CAM 3500FX autofocus sensor handles 51 AF points, aligns its 15 cross-type sensors in the central viewfinder area to detect contrast in both vertical and horizontal lines for better AF performance. Nikon D3 / D4 AF Engine Multi-CAM 3500FX capable of maintaining accurate focus even on a high-speed subject such as an F1 racing car traveling in excess of 300km/h. However, simple predictive tracking AF does not provide maximum focusing performance for a subject that abruptly changes direction moving at high speed or a subject with low contrast moving randomly. To focus accurately on such a subject, the AF system must accumulate data of the locus of the subject’s movement using multiple focus areas so that appropriate judgment can be made. Both Canon 1DX and Nikon D4 captures Full HD movie @ 30, 25, 24 fps, but with Nikon you get more options such use of expandable ISO range in video shooting and you can record 1,920 x 1,080/30p Full HD and HD movies in three formats that are FX-, DX-based and 1,920 x 1,080 crop movie format. Storage: 1DX coming with two slots of high-speed UDMA 7 Compact Flash cards, D4 also comes with two slots one for UDMA 7 and the other slot for the new XDC card format. Price: Nikon D4 cost $800 less than the Canon 1D X. 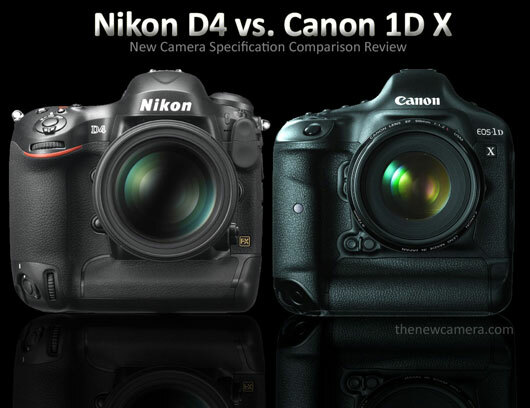 Conclusion: Canon 1DX have more advance core specification than the Nikon D4, But Nikon D4 is more versatile and Canon 1D X have some limitations.